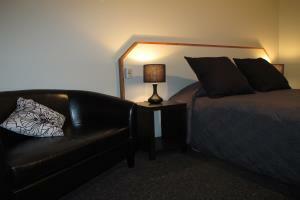 Queen bed studio with cooktop, microwave oven and fridge kitchenette facilities. Private ensuite bathroom. 150m walk to the beach. 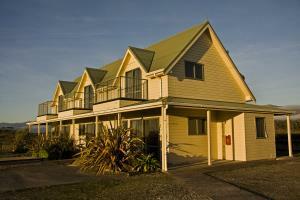 Family unit with cooktop, fridge and microwave kitchenette facilities. Private wheelchair access bathroom. Downstairs has 1 Queen bed in living area, upstairs room has Queen bed, 2 single beds and balcony. 150m walk to beach. Motel has 1 Queen bed down stairs in living area, upstairs Bedroom 1 has 1 Queen bed and second bedroom has 2 single beds. Upstairs hsd second toilet and main bathroom is down stairs. Mountain views. Apartment Style motel. Mountain views. Spacious unit with super king bed. Seperate bathroom. Kitchen has fridge, microwave and cooktop. Wheelchair access studio. Ground floor access. Larger than our standard studios. 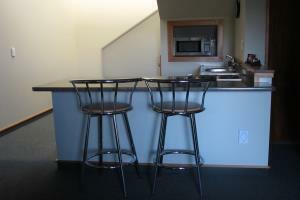 Kitchen has cooktop, fridge and microwave. Wheel-in shower and Queen bed in living area.